Browsing through food websites is one of favorite pastimes (even though it makes me extremely hungry). But after browsing through the sites I always loose track of the recipes I wanted to try, and i'm left backtracking weeks later to find the meal my stomach had been growling for. Well I won't be backtracking anymore thanks to this incredible website called KeepRecipes. You can keep recipes from any website by adding their button to your browser, and the recipe will be stored in your virtual recipe box. 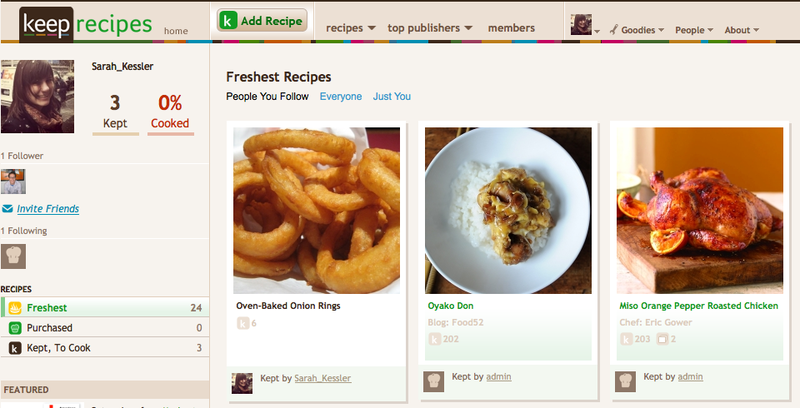 You can also add your own family recipes or keep track of what your friends are cooking by following their recipes. how fun. kind of like pinterest but for recipes?